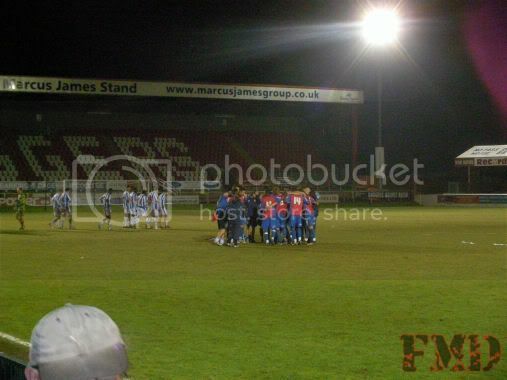 I have said this before and I will say it again, I love the Essex Senior Cup! Something about this little county cup gets me all excited and I was genuinely disappointed when we got knocked out in the semi's last season. So when we were handed a home draw to Colchester United (the self same team that had dumped us out last year) I had mixed feelings. 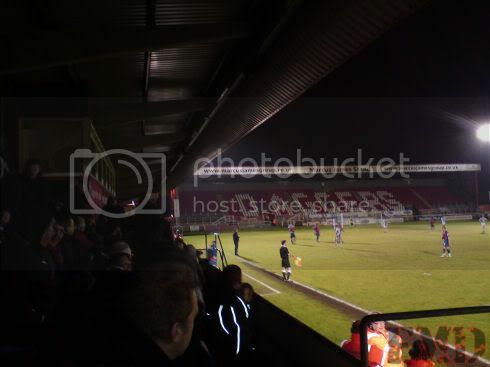 See the thing I love about the ESC is those away days to non-league clubs. So while knocking out Colchester would certainly give me a nice feeling of revenge, getting knocked out would mean no away days to small Essex clubs and with Grays, Harlow, Canvey, Barking, Romford etc still in the competition I would most disappointed. MrsMetalDagger got in from work just as I was preparing our dinner, my Daggers shirt was drying on the radiator and I was walking around in an old t-shirt and my blue Daggers shorts. Excitement was in the air, tonight we dine in Essex!! (or summin'). With two chicken fajitas well and truly eaten and shorts replaced with combats and cheap shirt replaced with home colours we were ready to leave. We waited at Upney station for Jerk' to get home from his days work as a brain surgeon. His train arrived and in an act of supreme athleticism we ran down to the last carriage where he was sitting. Once aboard pleasantries were exchanged as was a sip of rum and coke, nice! 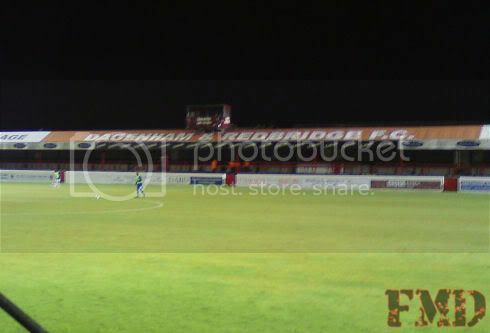 We pulled into Dagenham East and it was fairly obvious we weren't in for a packed house tonight, from what I could see no one else on our train was here for the Essex derby. Straight into the clubhouse I saw nearly all of my match day crowd were there and I finally got to meet Anthony72 in person. With a quick pint quaffed, we headed for the Carling Stand (the only available stand for the night). We found some seats just as the game was kicking off and sat down for what was gonna be a pretty exciting match. Looking at the team I noticed Phil Walsh was playing as a centre back and it looked like Danny J Green was playing upfront next to Josh Scott. Straight away this looked like it was going to be an attacking game, with both teams looking to load the ball into the box from crosses and long balls as well as some nice runs. it was sometime in the first 10 minutes that WalesDagger mentioned that he thought that Luke Wilkinson’s hair looked a little feminine or some such, which caused the woman and her 2 girls in the row in front to wheel round and introduce themselves as Mrs Wilkinson and her 2 daughters! So now we had 2 forms of entertainment; one was a football game, the second was watching a red faced Welshman back peddle faster than the Bulgarian international reverse-unicycle team going downhill backwards! The Sieve, empty - spoooooky! Luckily Luke's mum is a very reasonable woman and laughed at our embarrassed friend. About half hour had gone when Josh Scott shot from the edge of the box into the net to make it 1-0 to the Daggers and although Colchester were far from lying down and letting us win, we seemed to be in the mood to get through the round. Colchester nearly scored when a freekick hit the bar and the resulting rebound was headed over the goal. With 10 minutes left in the half, me and Jerk' made a beeline for the burgers to avoid the rush. Back to our seats with one of Dagenham's patented "Fookin tasty" burgers and a cuppa in hand we watched the final 5 minutes of the first half. So far it was looking pretty good for this year’s county cup campaign. The second half started and the Daggers came flying out of the traps looking for goal number two and Colchester kept on looking for that elusive equaliser. So far in this game I had been impressed with quite a few of our 2nd string players, Billy Bingham seems to have a good solid shot on him for a midfielder, Danny J Green looks like he will run his nuts off to get to a ball and his work on the ball doesn’t look to shabby either. Darren Currie looked like the veteran player on the pitch, what he may have lost in pace he made up for with good footwork, good decision making and neat passes. it was a joy to watch the younger opposition players stare dumbfounded at the patch of grass where the ball was half a second ago as Darren was 2 feet behind them whipping in a ball. Chris Lewington continues to impress me as a good shot stopper and improves with every game. Back to the game; at 70 minutes it was looking like we could shut out United and walk out with at least a 1-0. But Colchester were looking to repeat last season and finally found the net on the 78th minute when Medy Elito crossed the ball in for Ian Henderson to tuck in. 1-1. After what seemed like quite a long 10 minutes the whistle blew and everyone got lined up for extra time. The match was looking very level as both teams battled for the winning goal and just before the end of the first half of extra time DJ Green struck from the left and past the outstretched United 'keeper, 2-1 to the Daggers. At this time Jerk and a couple of the others disappeared for a smoke (they left the gate open for smokers on this occasion). By the time they had sat back down Anthony Wordsworth had scored an equaliser for the visitors. 2-2. With only minutes left Dagenham were awarded a corner which Graeme Montgomery whipped in, out of nowhere came Mrs Wilkinsons baby boy to smack the ball into a goal, Well if WalesDagger hadn't already eaten his words, he was gonna have to now! We congratulated Mrs Wilkinson for giving birth to our latest scorer and the game continued. The clock counted down and Colchester hoofed the ball forward hoping to find a forward in a good position, on 120 minute a ball flew out to the right side of Lewington's box and as he scrambled to grab the ball caught Joe Martin and brought him down in the box, the referee pointed straight at the spot and it was looking like this game was going to penalties! Liam Henderson stepped up to the spot, He kicked the ball, Lewington dived to the right, the ball hit the crossbar and went over!! Lewington took the goal kick and the referee blew the final whistle. 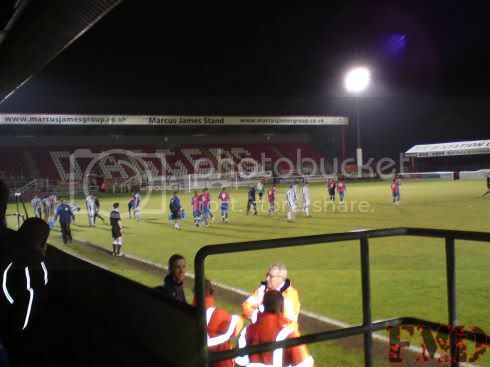 Dagenham and Redbridge had made it to round four and for those that missed that moment here is a video. I think all in all the 200+ Daggers that attended can be pretty happy with a win in a match between the 2 highest placed teams in this competition. Glory and many good non-league ties await!! Next - Hartlepool, and then I’m off to see family and a football game in Southampton!